M27, commonly known as the Dumbbell Nebula, is a bright planetary nebula in the constellation Vulpecula. The Dumbbell Nebula is a popular target for beginners in astrophotography because it delivers incredible results with minimal exposure time. The Dumbbell Nebula is a satisfying target to capture through a DSLR camera and telescope, as the bright color and details of M27 are revealed in a relatively short exposure. Using Narrowband filters can help reveal the outer structure of this object (particularly Ha and OIII). However, a broadband true-color image with a regular DSLR camera is quite impressive on it’s own. This is a 1 hour and 20 minute exposure with a stock Canon Rebel Xsi DSLR through an 80mm telescope. 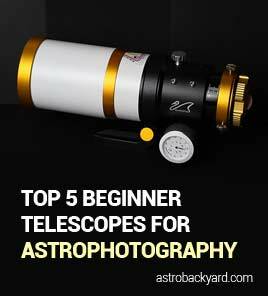 You do not need to modify your DSLR camera to enjoy capturing many of the deep sky astrophotography targets in the night sky. This photo was captured while camping at Rockpoint Provincial Park. It was a very warm and clear night, and the campsite I selected had a nice open window to the sky. “Astronomy Camping” is one of my absolute favorite activities to partake in during the Spring and Summer months. 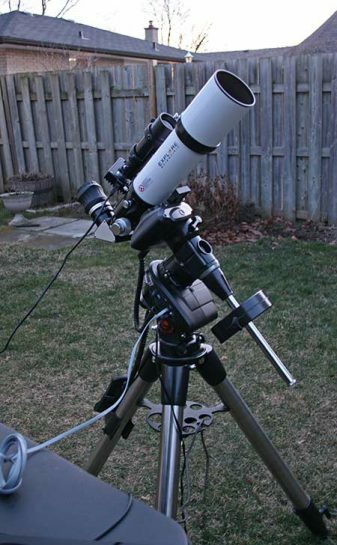 The astrophotography equipment used to collect these images is shown below. The primary imaging telescope is an Explore Scientific ED80 Triplet APO refractor with a focal length of 480mm. 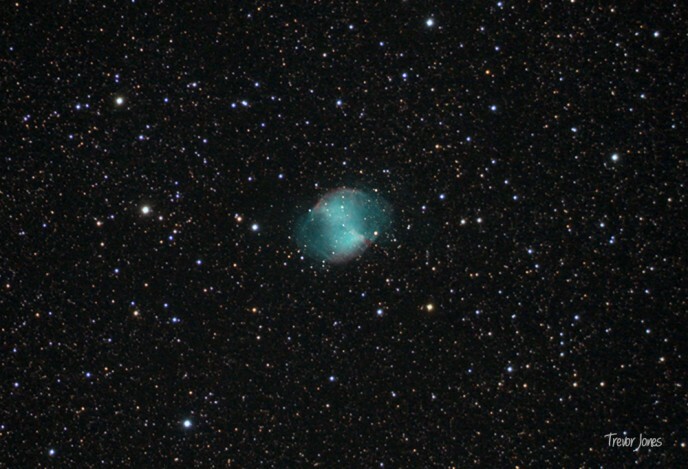 At this magnification, the Dumbbell Nebula appears quite small in a sea of colorful stars. The image below shows just how wide the field of view is using this telescope on a small target like the Dumbbell Nebula. For an annotated version of the image below, visit my Astrometry.net results page for this object. This free tool is a fantastic way to discover exactly what you have captured in your image. Interestingly enough, the Dumbbell Nebula was the first planetary nebula to be discovered by Charles Messier in 1764. It has a visual magnitude of 7.5, which is extremely bright as far as deep sky objects are concerned. 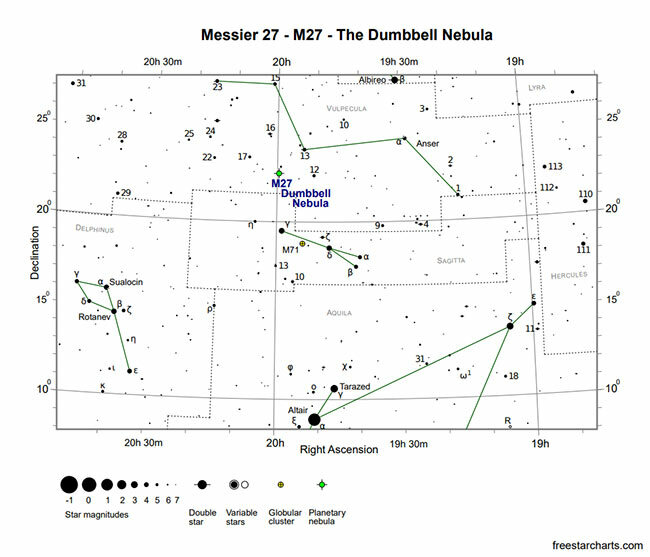 Messier 27 is easily visible in binoculars or a small telescope. In the middle of the Dumbbell Nebula, you may notice a central star. This is classified as a White Dwarf, which is estimated to have a radius of 0.13 light-seconds. As small as this may seem, it is actually quite larger than most White Dwarf stars. Messier 27 was the subject of my video in my review of the Altair Hypercam 183C back in July of 2017. It was not a true reflection of this camera’s capabilities, as I was still learning how to properly use my first non-cooled dedicated astronomy camera. Since this video was shot, I captured many more incredible images with the original Hypercam 183C. A similar nebula is the Helix Nebula, which I have only photographed once before. From my latitude in Ontario, Canada, the Helix Nebula does not reach very high from the Horizon. This makes photographing this target difficult. 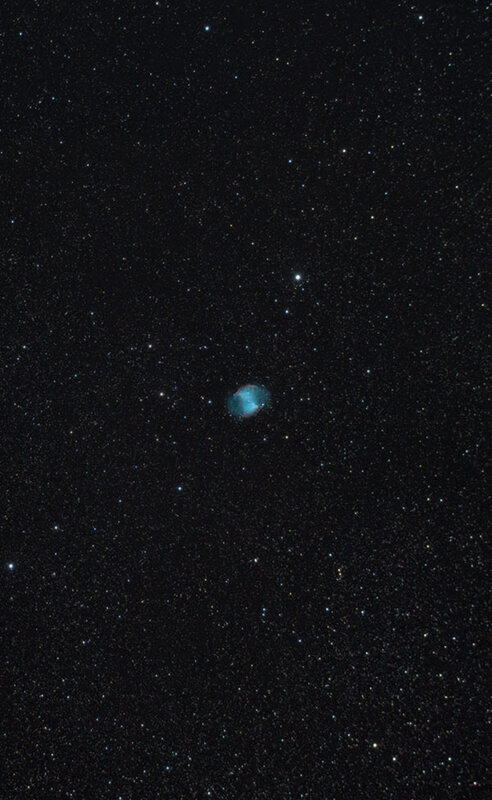 The images of M27 on this page were captured using a Canon Rebel Xsi (stock) DSLR camera through an Explore Scientific ED80 telescope. The telescope tracked the apparent movement of the night sky on a Celestron CG-5 GoTo equatorial mount. Autoguiding was used thanks to an onboard Orion Mini 50mm Guide Scope and a Meade DSI Pro II astronomy camera. Each individual image was stacked using DeepSkyStacker to improve the signal-to-noise ratio of the final image. The resulting image from DeepSkyStacker was processed further using Adobe Photoshop. For a better understanding of this process, please view this Photoshop image processing tutorial video.